I really find this card funny – for a variety of reasons – not the least of which is that it allows me to make a little fun of the New York Yankees…. So let me get this straight. Matt Nokes walks in free agency because the Yanks have a young catcher in the minors who is playing pretty well and the team can obtain a supplemental draft pick when he signs with another organization. The Yankees then use that pick on someone named Brian Buchanan – a big 6’3, 190 lbs left-handed pitcher out of high school. Of course, as you (the reader) no doubt see, Buchanan played JV baseball for two years and didn’t pitch his junior season. So, the Yankees drafted a guy with exactly 42.2 varsity high school innings. Not typically the recipe for success. He’d spend six years in the Yankees minor league system tapping out at AA. He’d finish with not exactly horrible minor league numbers spread over nine years (3.99 ERA, 1.47 WHIP and 7.2 Ks/9). What really hurt him was his control; he’d walk 4.1 batters per nine in the minors. Unfortunately, like so many other draft picks, Buchanan would never toe the rubber for a major league ball club. As for the other Brian Buchanan – and seriously was it the PR departments idea to draft guys with the same name in back-to-back years — he’d log 14 seasons in the minors, finishing with a .279/.341/.450 slash line and 141 HRs. 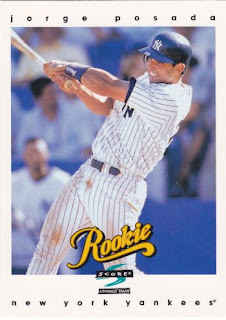 He’d never play for the Yankees as he, along with Eric Milton, Christian Guzman and Danny Mota would be shipped to the Twins in exchange for Chuck Knoblauch. Truly this trade helped both sides. The Twins ultimately got two steady major league performers and Knoblauch played a solid second base for the Yankees. However, Buchanan would do nothing for the Twins – hitting a grand total of 16 HRs in 414 ABs before being traded to the Padres for Jason Bartlett. Of course Bartlett would put up some great minor league numbers (.299/.373/.417) leading him to become a semi-darling of the stat-community. He was then packaged along with Matt Garza for, predominantly, Delmon Young. So, the Yankees got no major league appearances from back-to-back Brian Buchanan first round draft picks. Of course, they did turn one into part of chuck Knoblauch — which is a pretty good thing. You have to love the MLB draft – strange things always seem to happen which is decidedly the case with the only two MLB players to have been named Brian Buchanan. This is Terry Mulholland’s rookie card. He was a first round draft pick of the Giants in 1984 as a 23-year-old. He’d never perform well in the minors (723.2 IPs, 3.69 ERA and 1.49 WHIP), so it isn’t terribly surprising that he would have to work as a gas station attendant during the off-season. Clearly he wasn’t drawing the Annie Savoy bedroom eye dollars. It took him four years, but by 1988, the Giants would pay him enough ($70,000) to leave the Chevron behind. However, his finest year wouldn’t come until 1993 for the Philadelphia Phillies for whom he would go 9-10 but post a 3.34 ERA and a 1.19 WHIP. He’d follow that up with back-to-back 225+ IP campaigns. Mulholland would also be part of five different trades that included the likes of Steve Bedrosian (who was himself traded three times between the Braves, Giants and Phillies), Dennis Cook, Desi Relaford, Jose Hernandez and Paul Shuey. In addition, Mulholland was part of the oldest battery (along with Pat Borders) in baseball history and pitched the first no-hitter in venerable Veteran’s stadium history. Given his longevity as a LOOGY, it’s not surprising that his career compares favorably to Jeff Fassaro, Greg Swindell, Shane Rawley and Darren Oliver. Still, his most memorable start would be game six of the 1993 World Series. He’d give up five runs in five innings of work, but pitch well enough for the Phillies to be in position to win the game when, hells bells, Mitch Williams entered. Unfortunately, Williams would give up a walk-off season-ending home run to Joe Carter that led to the leap of joy. In all, Mulholland would pitch 20 seasons and earn $20.1 million — enough to buy a lot of cool baseball cards. Along the way, he would make stops in Philadelphia, San Francisco, New York, Atlanta, Minnesota, Chicago, etc. That’s a lot for a guy who started off needing to pump gas in the off-season. Oh, and one other thing, he recorded a win in 18 consecutive seasons, tied for the 51st longest streak in major league baseball history.